One of the editors actually visited this church this summer, and we can assure you, it is REMOTE! Brumfield, in his understated way, doesn't describe the condition of the road leading to this village, but it is barely passable at times. The number of remarkable architectural and other treasures hiding in the Russian hinterlands, especially in the north, is rather extraordinary. His most recent book is a real treasure, Architecture At The End Of The Earth, Photographing The Russian North (2015). (Amazon). This truly beautiful book was made possible by the support of a US philanthropist, and its true cost is 3 times its retail price, and we can't recommend it highly enough. Don't believe in miracles? Well, we can assure you, Brumfield's work is undoubtedly just that. The turbulence of the past century has left many abandoned architectural monuments in Russia’s regions — parish churches, former estate houses, log houses and churches in villages where no one lives. However modest, they all reflect the history of their area, and some of them are — or were — masterpieces of creativity. One of these monuments is located in the tiny village of Korovye near the Viga River just off the road to Chukhloma. Although the village name is modestly derived from the word for “cow,” its church has the imposing and unusual dedication to the Convocation of the Mother of God. 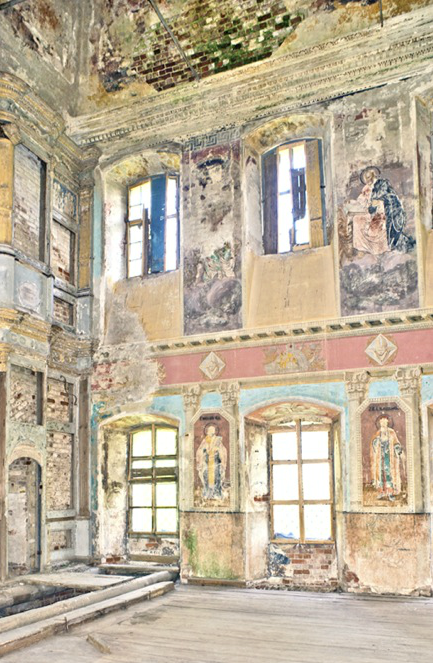 Within the abandoned church is one of the most unusual displays of religious art in all Russia. On the walls of the main structure, the artist in effect created a miniature Renaissance palazzo for the display of the sacred images. The village of Korovye was originally known as Verkhniaia pustyn (“Upper wilderness”), a reference to one of the three monastic retreats founded in the Chukhloma area by St. Avraamy Gorodetsky. Dissolved in the middle of the 18th century, the small monastery’s two wooden churches — dedicated to the Convocation of the Virgin and to Elijah the Prophet — were converted to use as parish churches. 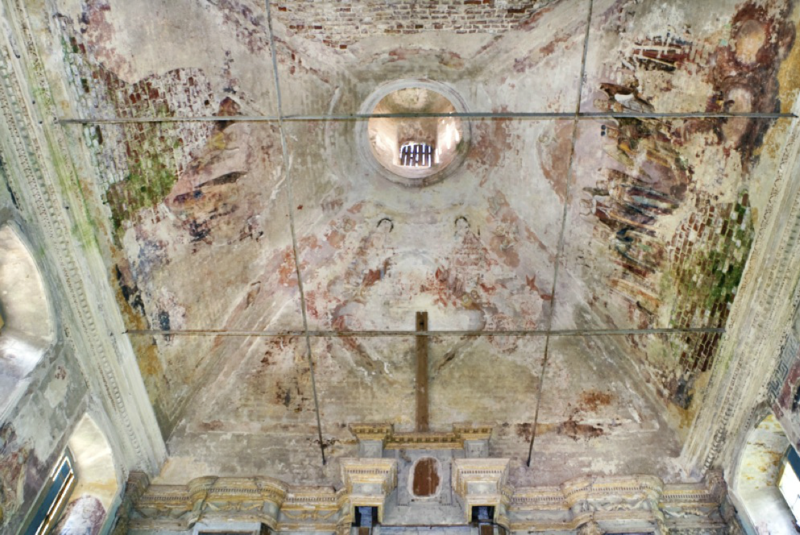 In 1797, parishioners provided resources to rebuild the former as a large brick church that would serve a group of 34 villages (most of which no longer exist). Attributed to the noted Kostroma architect Stepan A. Vorotilov (1741-1792), the design reveals a professional mastery unusual for a rural church. Whereas typical parish churches had a sprawling refectory with additional altars that pushed the main structure away from the bell tower, here all the components are tightly integrated. The structure rests on a ground floor that contained secondary altars and was used for worship in the winter months. Above the ground floor rise the essential components of a parish church: the main worship space with two rows of windows and five cupolas, a rectangular apse for the primary altar at the east end and on the west, a compact refectory and magnificent bell tower over the main entrance. This sophisticated, technically demanding design created a coherent visual tie between the primary components of the church: the bell tower and the core structure with five cupolas. The main interior space on the upper floor was dominated by an elegant neoclassical iconostasis. The majestic character of this design was demonstrated when the Convocation Church was chosen for a visit by Emperor Alexander I and his wife Empress Elizabeth on their way back from a visit to the Urals territory in the fall of 1824. Indeed, during the first half of the 19th century, this church could claim to be the most imposing in the Chukhloma region, surpassing even those in Chukhloma itself. A fire in the late 1890s damaged much of the interior and led to a major renovation that extended from 1903 to 1906. On the ground floor, a refectory (containing altars to Elijah the Prophet, St. Nicholas and St. Avraamy Gorodetsky) was expanded on the north and south sides. The expansion was artfully hidden by a grand staircase that curved upward from both sides to the main portal on the second level of the bell tower. This skillful renovation — and particularly the stairway — gave the church a still more imposing appearance as it soared above the two main streets of the village. Yet the great miracle occurred on the interior, whose walls were repainted under the direction of a Moscow artist identified as Anufry A. Bakhvalov, a native of this area. Although the work of Anufry Bakhvalov is little known, the scope of imagination represented by these wall paintings is extraordinary, even daring. The artist did not simply depict the religious subjects in a Renaissance-based style typical of academic painting, he painted the subjects within imposing Renaissance frames situated between neoclassical columns with lavish composite capitals — and all of this in trompe l’oeil (on a flat, two-dimensional surface). At some points, Bakhvalov even painted the shadows cast by the illusory frames. The interior space had become a miniature Renaissance art gallery. 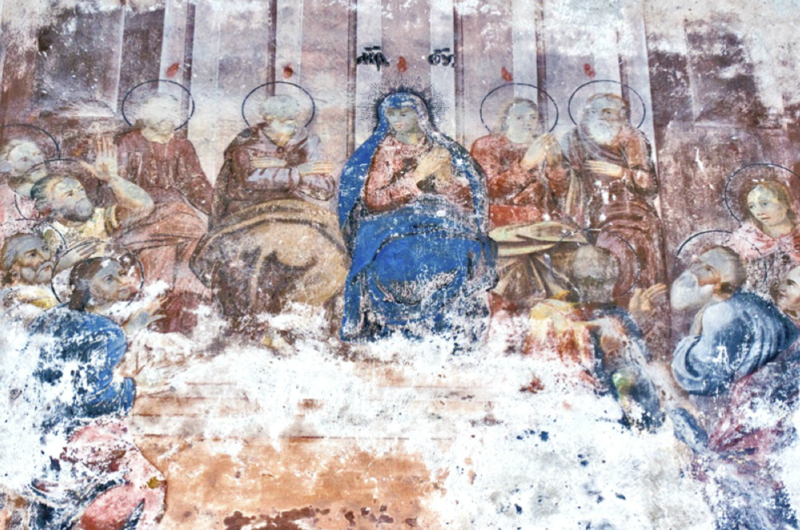 Surviving fragments of the paintings on the north and south walls include full-length figures of St. Vladimir, St. Catherine, St. Nicetas and St Macarius on the lower level between the windows. 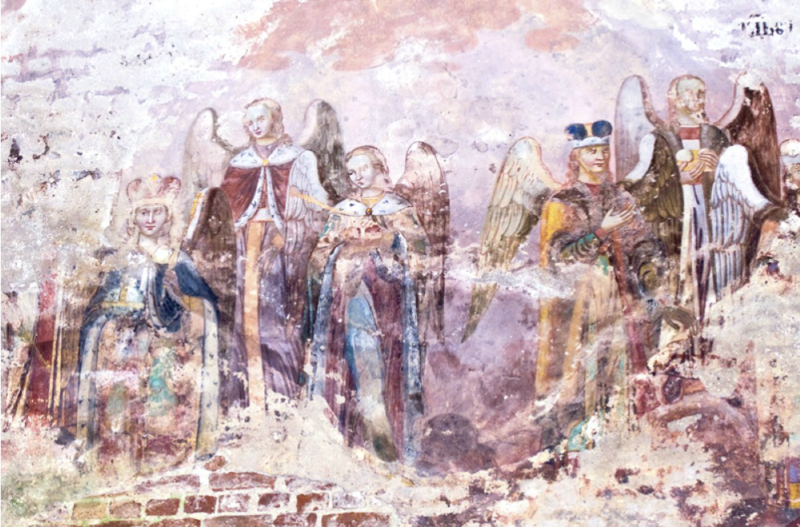 The upper level of the north and south walls is devoted primarily to a portrayal of the Evangelists Matthew, Mark, Luke and John with their symbols — another unusual artistic decision. (The Evangelists are often depicted on spandrels beneath the main dome, but spandrels are absent in this structure.) On the south wall are John (now effaced) with the eagle, and Mark with an endearingly vivid depiction of a guardian lion. On the north wall are Matthew, compelling in his concentration and assisted by an adoring angel; and Luke with the bull (both largely destroyed). The north wall also contains a depiction of Christ with Mary and Martha, the sisters of Lazarus — one of the most moving episodes in the Gospel account of the life of Christ. Equal to the Evangelists in their artistry are the three scenes above the arch in the west wall: the Miracle of the Loaves and the Fishes (Christ feeding the Multitudes) on the left side; Pentecost (Mary and the Apostles) in the center; and a vivid depiction of Balthazar’s Feast on the north side of the west wall. Throughout, there is evidence of the artist’s knowledge of Renaissance art, particularly in Balthazar’s Feast, which depicts armed horsemen storming through the gate of the burning city. On the east, the apse contained a depiction of the Last Supper, now almost effaced. The ceiling vaults in their height represented a culmination of the visual program. Although much has been lost, fragments remain of the august display of the Synaxis (Gathering) of the Archangels, part of the larger concept of the Convocation of the Virgin. Crowned archangels and angels gather on the north and south flanks, while the east flank was devoted to the cartouche with the Crucifixion (destroyed). The west flank presumably had a depiction of the Mother of God enthroned. Unfortunately, the Convocation Church’s glory days were soon eclipsed by the rise to power of an avowedly atheistic regime. Although it survived longer than many other churches, the Convocation Church was closed in 1937 during a renewed wave of terror against religion. Subsequently the icons were removed, and the ground level was used as a storehouse for various purposes. The cupolas were destroyed, and in the 1980s, the area of the church was apparently used as a detention center for juvenile delinquents. 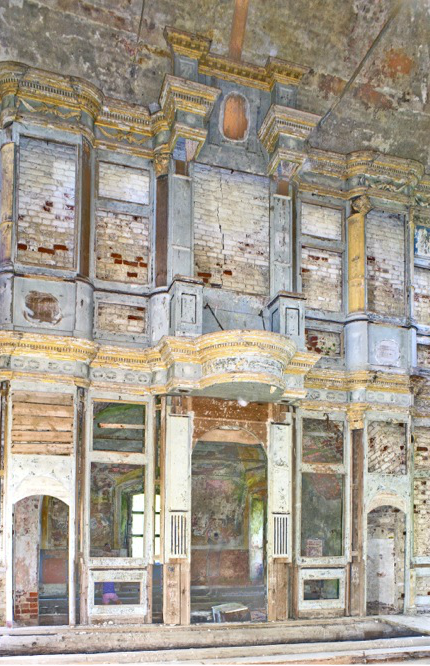 Unprotected and exposed to the elements as well as vandalism, the artwork of the upper level began to collapse. Recently, the roof of the church was replaced and the arch in the upper west wall was reinforced with a firm wooden brace. The upper level has been swept of debris, but the interior is still exposed and under threat of further deterioration. The fate of the remains of this extraordinary artistic creation is still in question.